I reviewed my Nanami Paper purchases in this post. 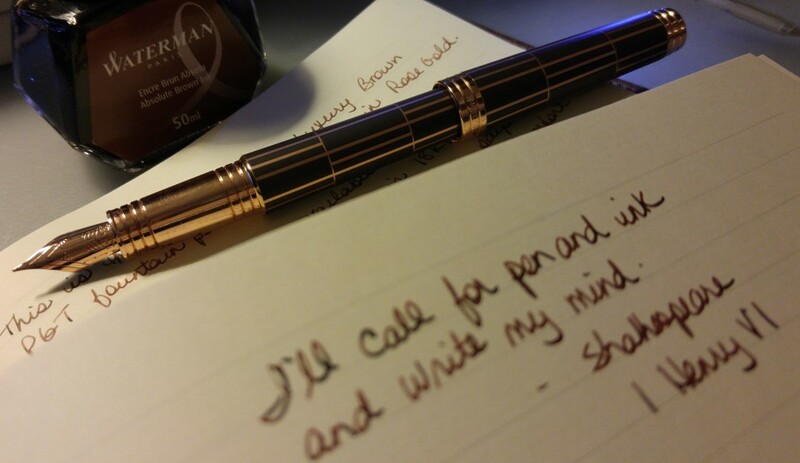 The first pen from a seller on FP Geeks arrived today. Review this Sunday I’m hoping. I am still waiting on my ebay pen (coming from China) and a pen from another FP Geek seller (coming from The Netherlands). Using my pen of the month, the ONLINE pen, is a bit of a challenge. I cleaned it before inking it up because it had not been cleaned in a while, and now I find it leaking at the section. I hope that is not a permanent condition. I will persevere. I went into Staples the other day for post-it notes and I couldn’t find any Winnable Executive Journals! I panicked. I’m almost finished my existing one and I really want another; I love the paper, and how flat it lays, and how I can stick all my paper stuff into it and it still looks good. I just might have to make a trip to Reid’s if Staples can’t help me out. I had a fantastic sushi dinner with friends on Saturday night. This particular group is precious to me; I have known them for a very long time and we have the absolute best conversations. You know who you are; love you guys. And yes let’s start a writing group! !